The Frostburg State University Department of Music will present bass clarinetist Todd Marcus and his quintet in a Guest Artist Series concert, titled “On These Streets (a Baltimore Story),” on Monday, Sept. 17, at 7:30 p.m. in the Pealer Recital Hall of FSU’s Woodward D. Pealer Performing Arts Center. A question-and-answer session will also be held at 6:30 p.m. in Pealer Center room 213. The recital and Q&A session are free and open to the public. Marcus is one of the few internationally recognized artists to focus on the bass clarinet in jazz. 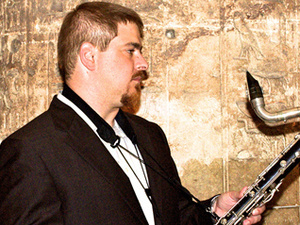 His unique projects offer a broad range of music, including Middle Eastern-inspired compositions that reflect his Egyptian-American heritage, socially inspired work capturing life in his Baltimore community, a celebration of the clarinet in jazz featuring clarinet great Don Byron and arrangements of jazz standards. Marcus’ latest album, also titled “On These Streets,” features quintet music written to capture elements of his west Baltimore neighborhoods where the death of community member Freddie Grey in April 2015 led to the city’s subsequent civil unrest. As a musician who has also worked as a community activist in this neighborhood for more than 20 years (at his nonprofit Intersection of Change), in his new album he seeks to portray the challenges and strengths of his community and find beauty in each. Also featured on “On These Streets” are Paul Bollenback on guitar, Bruce Barth on piano, Ameen Saleem on bass and Eric Kennedy on drums. Marcus’ past recognition includes a 2016 Jazz Hero award by the Jazz Journalists Association, a 2016 Chamber Music America New Jazz Works commission and a 2014 Baker Award – Baltimore’s most prestigious award. For more information, contact FSU’s Department of Music at 301-687-4109.